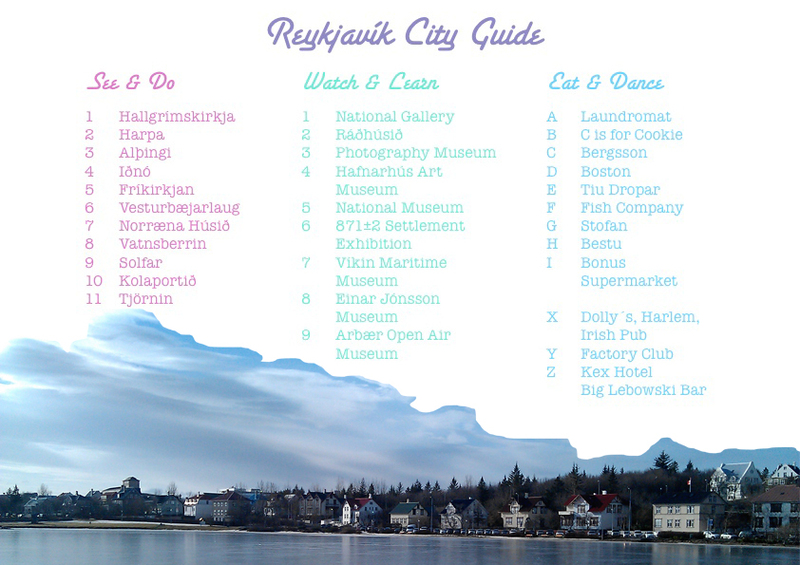 As someone who has lived in Iceland for a couple of months during the winter I guess I am qualified enough to give you some insight into the capital city Reykjavík. Hallgrímskirkja (1) is the iconic landmark church in Reykjavík and you get a spectacular view over the city from the tower’s top. After that go to the Einar Jonsson Museum (8) just around the corner and enjoy the wonderful sculptures either inside the museum or outside (for FREE) or both. If you are now already freezing from the ever-changing weather or just craving something sweet, go to C is for Cookie (B) just a few steps away. Walk down Laugavegur for some shopping and down to the Vatnsberrin (8). The Water Carrier is a sculpture by Ásmundur Sveinsson and among the most important, internationally known icelandic art pieces. You can also buy it as a cookie cutter in a set of four (also containing the Althingi parliament, the iconic Perlan water tower and Hallgrímskirkja) which you can buy in some gift or museum shops on the island. If you are now looking for a bite to eat, head down to Stofan (G). Its name already gives away its atmosphere: comfortable living room. When I first entered the Víkin Maritime Museum (7) I was not expecting what was to come. It is probably my favourite non-art museum in Iceland. You will learn EVERYTHING about fishing throughout the decades. Also there is a guard boat, which took part in the infamous cod wars, that you can visit every day at a specific time and I highly recommend checking the times, because it is so worth it! After that you can walk along the harbour to the Harpa Concert hall (2). It is one of the most perfect buildings architecturewise. With its million windows it looks like a giant fish laying in the harbour and the inside looks like a big bee hive. If you are staying a little longer you have to go to one of the concerts, because the acoustic is among the best in Europe. (Ticket prices range from 10 to 50 € – I call that extremely reasonable.) After that you can either head into Laundromat (A) for a Chai Latte amongst hip parents, colour-coded bookshelves serving as the bar, washing machines in the cellar and photos of wash salons around the world OR you can go and have the best fancy fish dishes in the country at the Fish Company (F). Not only is the interior stylish, but the cuisine is classic french with a twist. Go there (or anywhere for that matter) for lunch as prices are super affordable (50 % off usually). 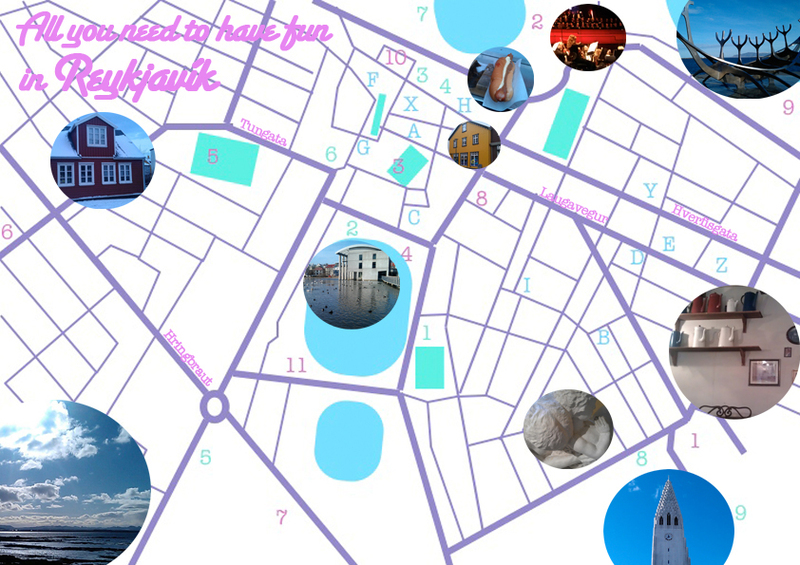 Now that you are close to the harbour take some time to visit the Kolaportið market (10). It is a weird mixture of second hand, antique books, sweets shop and fish market. And when you step outside again, please go for the best Icelandic hot dog at Bæjarins Beztu Pylsur (H). For some of the best black and white pictures of Icelandic children in lopapeysa (Icelandic sweaters) go to the photography museum (3) which is located in the city library building and please take the stairs as the best (black and white) pictures are found in the staircase! Also it is FREE admission. For contemporary art walk further down the road and go inside the Hafnarhús (4). More Icelandic art can be found at the National Gallery (1) near the city’s lake Tjörnin (11) where you cannot only take wonderful pictures of the townhouses and feed the ducks, but also can take a look at the beautiful interior of the Iðnó theatre (4). The Alþingi parliament (3) is the longest running parliament (in sessions) in the world. Behind the building is a tiny public park – being the first in Iceland. If you are a vegetarian or just a fan of fresh food, you’ll love Bergsson (C) – they have superb bread too! You’ve heard about the outdoor pools and hot pots? Go to the pool in Vesturbær (6), but have a quick look in your guide book for all the rules you have to oblige to when swimming in Iceland before you jump in. 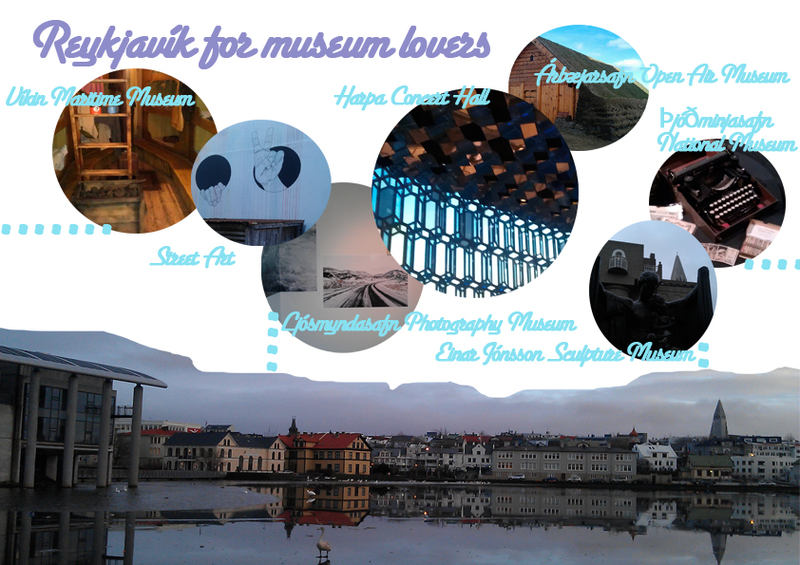 The most beautiful thing about Reykjavík? Its surroundings. With the sea and the mountains you have to take a walk when it is sunny! Don’t miss the Solar statue (9) which is worth a shot with your fancy camera. You’d like to try some typical Icelandic foods? Then head into Bonus (I) which is the cheapest supermarket in town. Don’t miss out on Skyr and chocolate covered liquorice! You long for an authentic Icelandic Swiss Mocca? Go to Tíu Dropar (E) (“just ten more drops”), my favourite downstairs café with old coffee pots, black and white family pictures and different chairs around each table. More history of Iceland? Go to the Settlement Exhibition (6) and the National Museum (5), which has recently been redone and a go to with children as it is now way more interactive. Arbær Open Air Museum (9) just outside the city center is great for experiencing the everyday life of the settlers and the first buildings. More architecture? The Nordic House (7) near the university campus hosts a lot of cultural events, houses a library and restaurant as well as a small shop with Nordic goodies. The town hall (2) is worth a look for its architecture alone, but there are exhibitions inside sometimes too. A drink with Icelanders? Go to Boston (D), a bar above a chic second hand store. Or the Big Lebowski Bar (Z) – everything Lebowski except bowling. For dancing I highly recommend Dolly’s or Harlem (X) – owned by super creative and hip Icelanders also great for dancing. Heard about the great Icelandic music? Go to Factory (Y) for some free gigs and great atmosphere. If you are more into Jazz: KEX hostel is your go to. A couple of weeks ago I discovered Leuven and it was awesome (despite being freaking cold)! Yes, this is bread on a stick! Smiley face out of confetti! Comb your hair – So hipster, so in love! P.S. : What is going on with all the scouts still wearing shorts?!?!?! I had a wonderful journey last weekend when once again traveling with the Eurostar to London to go see family. This was mainly due to the new Eurostar board magazine, which had wonderful and interesting articles in it. Among the many places to visit I also wrote down Luc Tuymans’ name for research later. The Belgian Artist (with a Dutch mother and a Flemish father) is not that well received in Germany, but found acclaim elsewhere. Tate Modern as well as the Saatchi Gallery in London have had several of his works exhibited. His subjects are mostly topics you wouldn’t want to paint about yourself: cancer, Holocaust and colonial Congo among gruelling others. 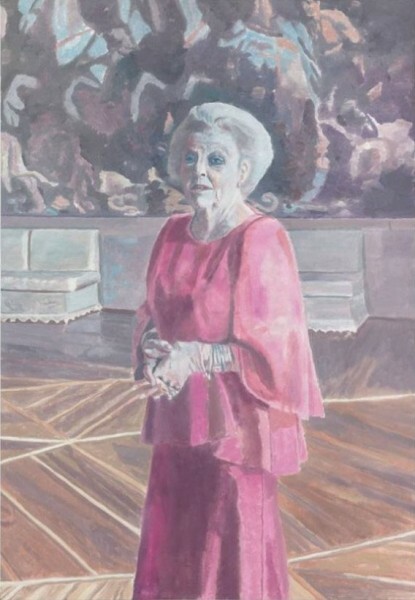 His latest impressive work on the other hand is a painting of the wonderful Queen Beatrix of the Netherlands, which will be opening the Stedelijk – the leading contemporary art museum in Amsterdam. Go and see it, if you get the chance! The museum is well worth seeing.